Release Day is here! The brand new Concord and 9th release is in stores now and I'm excited to bring you a fun tri-fold card idea! In the video tutorial, I give you a look at the new release plus a tutorial on how to make this card. 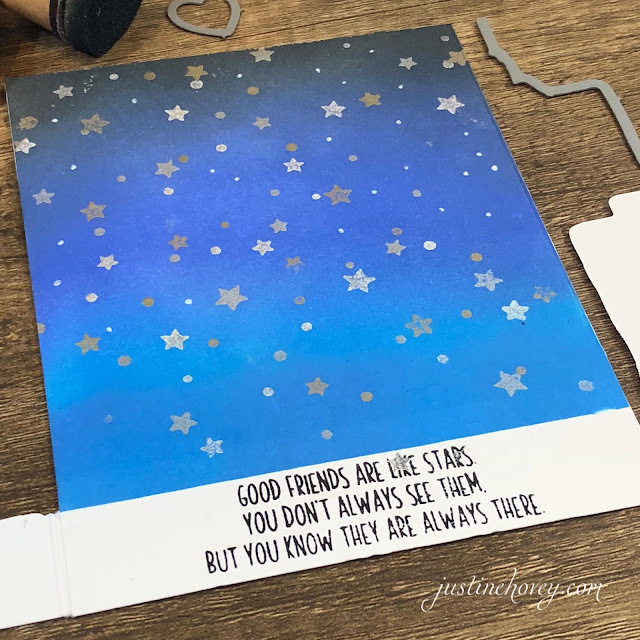 Since moving back to Canada, I have a lot of friends that I miss, so these sentiments are perfect for some cards to send to my girls :) Don't forget that you get a free Glitter Paper Pack with a $60 purchase and that the June Bundle is 10% off! 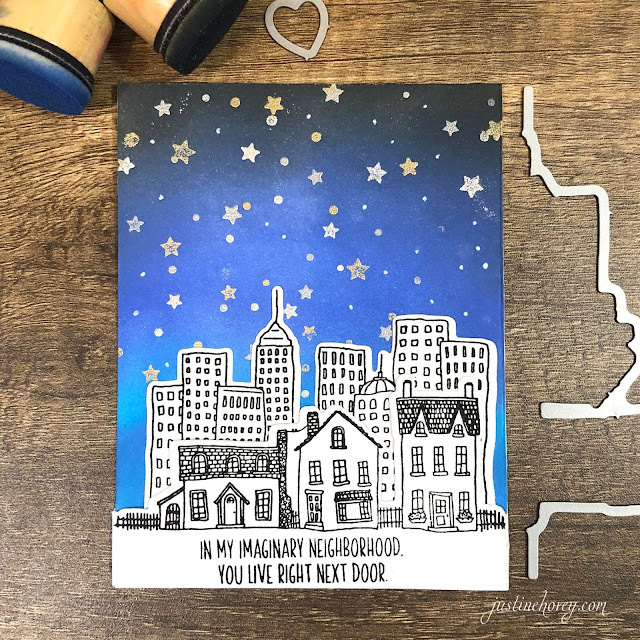 I wanted to create a scene with the neighbourhood, city in the background and a beautiful night sky with stars. It took some creative die cutting but it was truly easy to do because the background of the card is a double layer of cardstock which made it easy to know when to stop cranking the die cut machine. I love how there is a sentiment on every panel. It makes it really fun to open to see what it's going to say next. I began the background by using the Star Turnabout stamp. 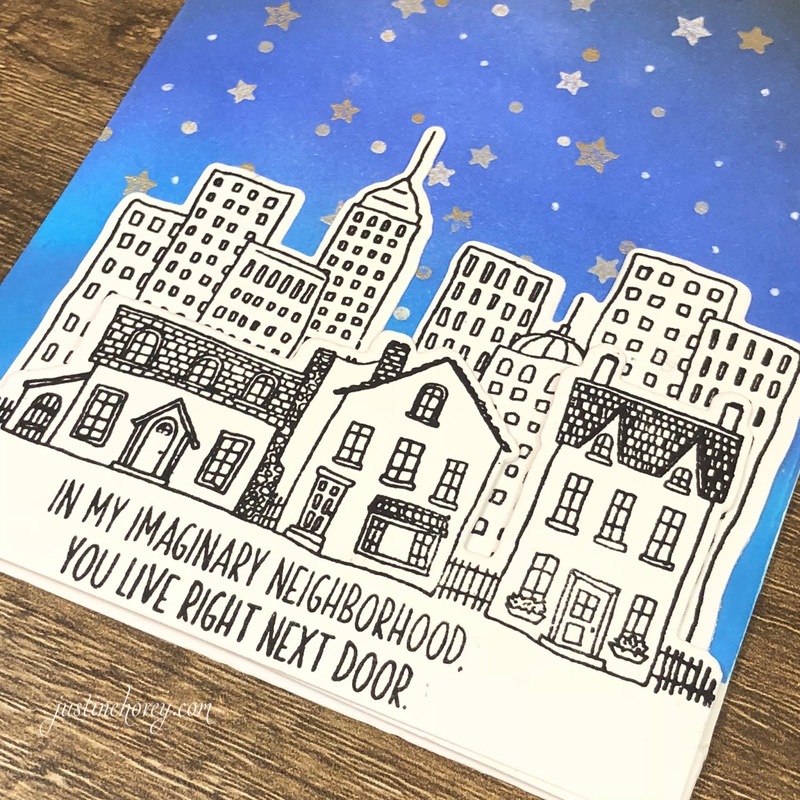 I embossed it in Sterling, Gilding and Icicle embossing powder from Brutus Monroe and filled in the spaces with a white gel pen. The background is a combination of Salty Ocean, Blueprint Sketch and Black Soot. This is a great card, Justine. Very well done with good instruction. WOW! Super cute card. I love this new release. Having a difficult time deciding what ones I should get. These two are on my list Thanks for sharing your talents with us and for inspiring us. 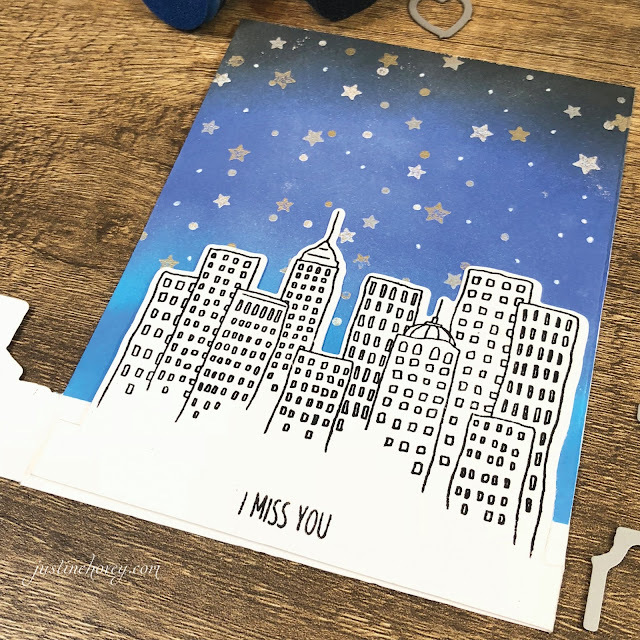 From watching other videos, i know that you can do "partial die cutting" by lining up the edge of your cutting plate with the farthest point you want to cut. The die won't cut if there's no top plate pushing down on it, so there's leas guess work when you put your card through a die cut machine.